Today’s report from the Census Bureau shows strong across-the-board improvements to household incomes in 2016. Household incomes rose 3.2 percent, after an impressive 5.2 percent gain in 2015; non-elderly households saw a similar rise of 3.6 percent this year after gaining 4.6 percent the year before. However, inflation-adjusted full-time annual earnings for men fell slightly in 2016, 0.4 percent, while women working full time saw an earnings increase of 0.7 percent. Men’s earnings are still below their 2007 level (by 1.1 percent points), while women’s earnings are now 2.3 percent above. Better across-the-board earnings growth would have made this year’s income report unambiguously excellent news, much like the 2015 report. This year’s report is mostly encouraging, but wages need to make strong and sustained gains before we can rest easy about how the economy is working for typical American households. While the gains in household income are not as impressive as the previous year, they nonetheless represent significant improvements. Part of this year’s slowdown in income growth relative to 2015 simply represents a small inflation bounce back. In 2015, plunging energy prices led to essentially zero inflation. In 2016, inflation rebounded to a still-low 1.3 percent. 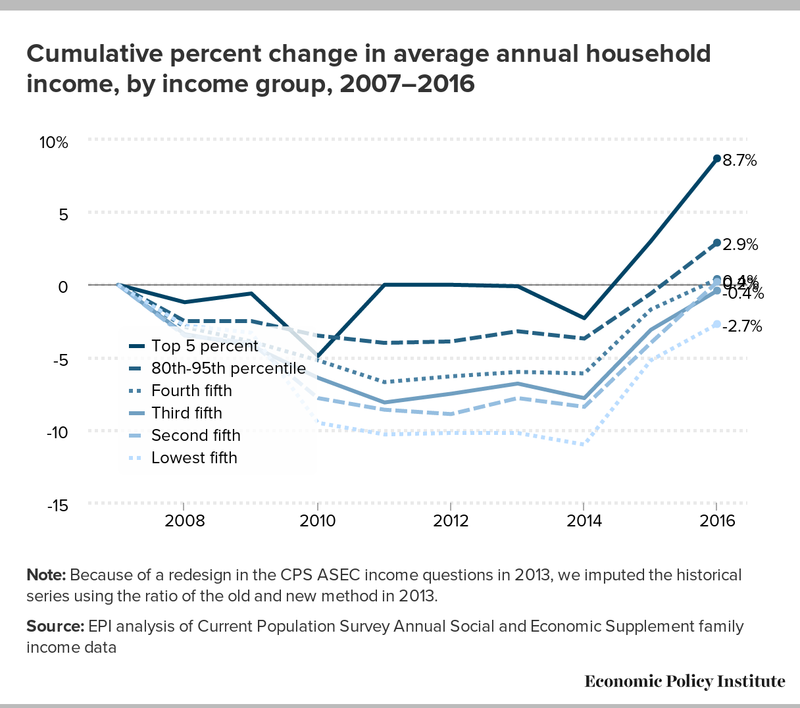 Besides representing a small slowdown in the pace of income growth, this year’s report reminds us that the vast majority of household incomes (when corrected for a break in the data series in 2013) have still not fully recovered from the deep losses suffered in the Great Recession—the bottom 80 percent of households had incomes in 2016 just at or below those of 2007 (while those in the top five percent are now 8.7 percent ahead). One more year of modest growth will likely bring the broad middle class back to pre-recession incomes. The Census data show that from 2015–2016, inflation-adjusted median household incomes for non-elderly households (those with a head of household younger than 65 years old) increased 3.6 percent, from $64,146 to $66,487. Median non-elderly household income is an important measure of an improving economy, as those households depend on labor market income for the vast majority of their income. This continued increase after large gains last year is a welcome trend. Median household income for non-elderly households in 2016 ($66,487) was 1.5 percent, or $1,005, below its level in 2007. It’s important to note that the Great Recession and its aftermath came on the heels of a weak labor market from 2000–2007, during which the median income of non-elderly households fell significantly, from $69,890 to $67,492—the first time in the post-war period that incomes failed to grow over a business cycle. 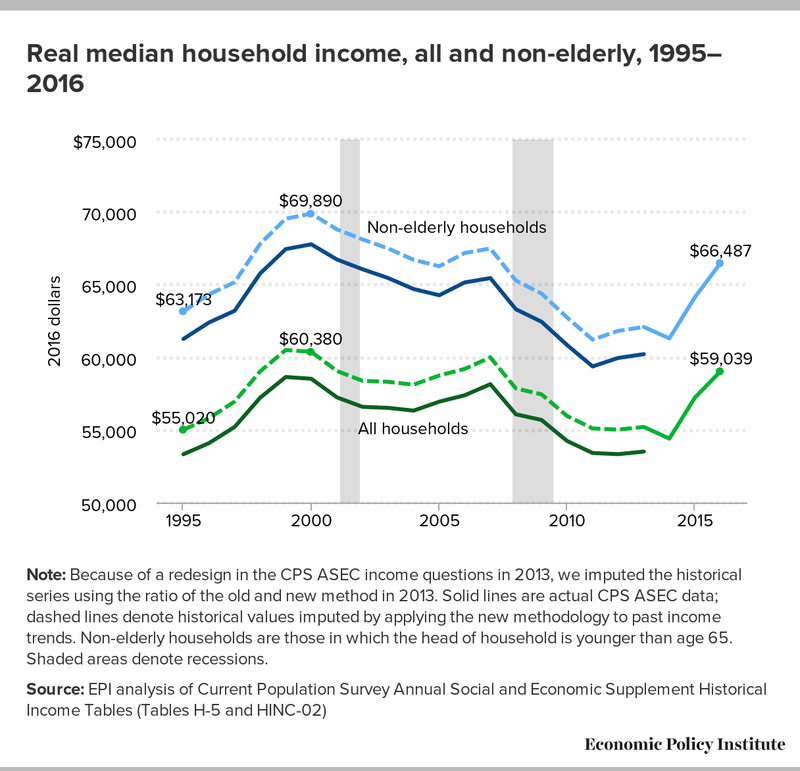 Altogether, from 2000–2016, the median income for non-elderly households fell from $69,890 to $66,487, a decline of $3,403, or 4.9 percent. In short, the last two excellent years should not make us forget that incomes for the majority of Americans have experienced a lost decade-and-a-half of growth. Note: Because of a redesign in the CPS ASEC income questions in 2013, we imputed the historical series using the ratio of the old and new method in 2013. Solid lines are actual CPS ASEC data; dashed lines denote historical values imputed by applying the new methodology to past income trends. Non-elderly households are those in which the head of household is younger than age 65. Shaded areas denote recessions. Besides lower employment and hours in the aftermath of the financial crisis, the key driver of the post-2000 income trends highlighted above has been stagnation of hourly wages over the last dozen years. The continued fall in unemployment and below-target inflation yielded solid inflation-adjusted wage growth in 2015, but the 2016 report paints a more mixed picture. For instance, the median man working full time, full year experienced an unfortunate fall in real earnings of 0.4 percent, from $51,860 to $51,640, in 2016. In addition, the median woman working full time, full year saw modest growth of 0.7 percent, from $41,258 to $41,554. Men’s earnings are still below their 2007 level (by 1.1 percent points), while women’s earnings are now 2.3 percent above. Looking over a longer horizon, however, the trends are starkly disappointing. 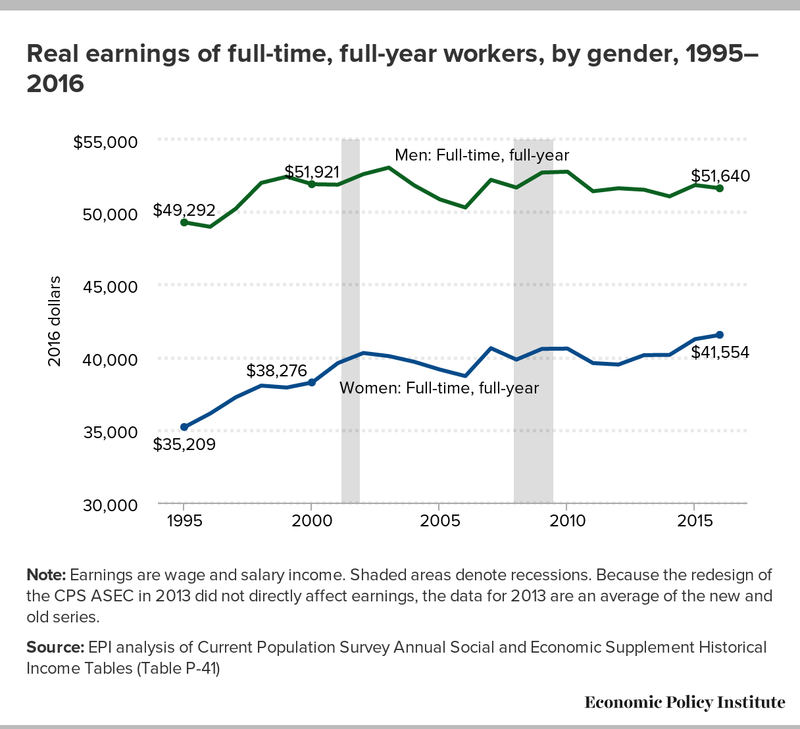 The median woman working full time, full year saw her earnings grow from $30,604 in 1973 to $40,303 in 2002, and then stagnate in the 2002–2007 recovery, reaching only $40,634 by 2007. Since the recession that began at the end of 2007, women’s earnings have recovered, reaching $41,554 in 2016. Full-time men’s wages dropped from $54,039 in 1973 to $52,223 in 2007, then fell further in the recession and have recovered only to $51,640 in 2016. Since 1973, the median man working full time, full year has seen no sustained wage growth. Note: Earnings are wage and salary income. Shaded areas denote recessions. Because the redesign of the CPS ASEC in 2013 did not directly affect earnings, the data for 2013 are an average of the new and old series. While the earnings of full-time, full-year women have improved since 1973, the closure of the gender wage gap slowed significantly over the last decade. The ratio of women’s to men’s earnings rose 17.1 percentage points, during the 27 year period from 56.6 percent in 1973 to 73.7 percent 2000, but only shrunk 6.7 percent points from 2000–2016. Women made 73.7 percent of men’s wages in 2000 and 80.5 percent of men’s wages in 2016. From 2015–2016, the gender wage ratio rose an impressive 0.9 percentage points. Unfortunately, much of this improvement due not just to women seeing faster growth, but also to men’s wages outright falling. The economy does have the potential to increase men’s and women’s wages and close the gender wage gap—between 2014 and 2015 both men’s and women’s wages did rise, while the gender wage gap narrowed. Low- and middle-income households have fared poorly since 2000 because of faltering wages compounded by excessive unemployment and fewer work hours due to the Great Recession. Figure C allows us to track the extent to which households at various income levels have been able to mount a recovery from the blow to income inflicted by the Great Recession and its long shadow (looking at each income fifth and dividing the top fifth into those in the top 5 percent and the next 15 percent). The data we cite in this graph corrects income growth for a break in the income series stemming from a redesign of the income questions asked in the CPS ASEC in 2013. Households at the bottom of the income distribution experienced larger income declines as unemployment rose from 2007–2010, and failed to see improvements even by 2014. The lower a household’s income, the greater the income losses were—exacerbating inequality. With the income gains of 2015 and 2016 we see that those in the top 20 percent are the only part of the income distribution to have significantly passed their pre-Great Recession income levels. Happily, the last two years has seen income growth that is more widespread. Those in the second lowest fifth had the fastest rise in incomes in 2016 (along with the 80th–95th percentiles). The lowest fifth saw a relatively strong increase of 2.6 percent, however, their incomes are still 2.7 percent below their 2007 levels. The middle fifth had incomes in 2016 that were just below (0.4 percent) those of 2007. One more year of normal income growth will restore middle-fifth incomes. Maintaining real wage gains and further lowering unemployment is the recipe for that reasonable outcome. Note: Because of a redesign in the CPS ASEC income questions in 2013, we imputed the historical series using the ratio of the old and new method in 2013.